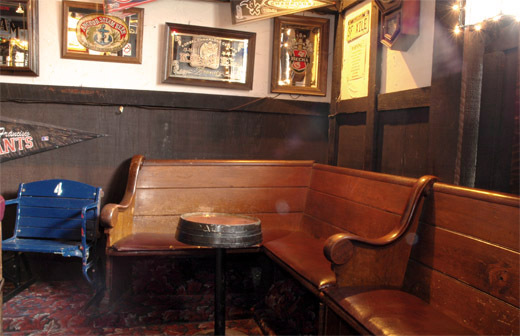 The Barleycorn is nearly 40 years old, but almost everything inside is far older. 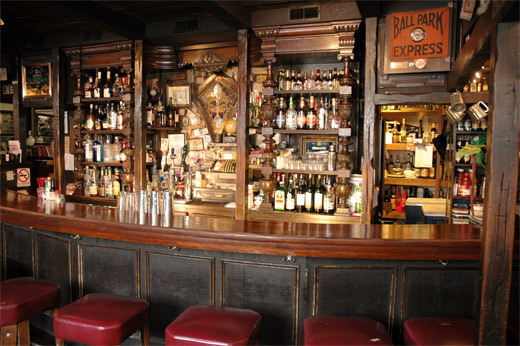 We start with the bar itself, which began life as a hotel lobby bar somewhere in Europe. It arrived in San Francisco by ship, and did service in a downtown hotel. 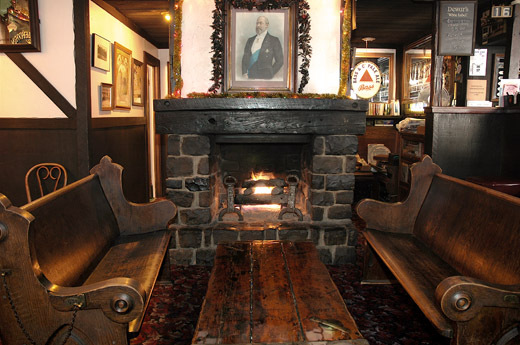 Sam Duvall, the founder of the Barleycorn, found it in storage. He took the two wings of the bar and joined them together, forming a semi-circular bar, and left the enormous straight middle section in storage. There is a seam in the center of the bar where the two sections were joined. Next came the breakfront, which was found in a mansion in Pacific Heights. It too arrived here by ship, and is about 180 years old. Across from the bar are cable car benches below the stained glass windows, and there is another under the plate glass window that looks out on the corner of California and Larkin where the cable cars pass by. The plate glass window, by the way, represents the only significant change in the interior in 35 years; it used to be stained glass like the other side of the room. Across from the window are two church pews from Old St. Mary's that are 1906 earthquake survivors. In between them is a hatch cover—a door that works vertically—from a Gold Rush ship. There's a million hatch covers around the city, and it seems that every last one of them is a coffee table now. 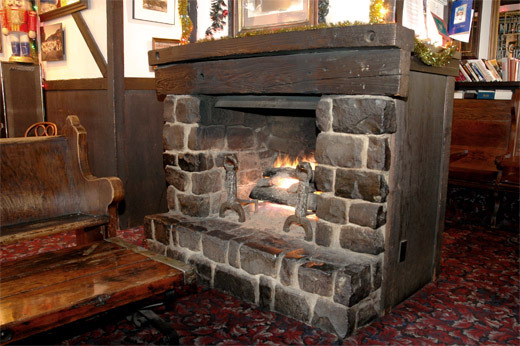 The fireplace is constructed from cobblestones from Hyde street two blocks away. As many of the cobblestones used in building the city's streets came from the ballast on board abandoned Gold Rush ships, there is the possibility these stones originated far from San Francisco. 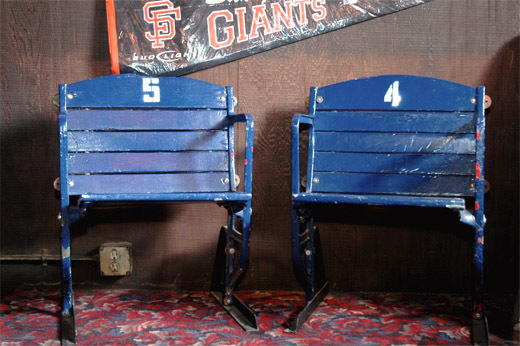 Finally, early in 2006 we replaced our no-longer-functioning, 45-playing jukebox from 1970 with these stadium seats which came from a minor league park in Tacoma, Washington. When they built that stadium in Tacoma, they obtained their seating from another park that was being torn down, Seals Stadium here in San Francisco. These seats left town in 1959 and just returned, so way back when, folks were watching Joe Dimaggio and Lefty O'Doul in these seats.